Phoebe believes that her adoptive mother’s spirit resides in a cat that jumped into her guitar case in Central Perk. Monica goes on a date with Rachel’s hunky high-school boyfriend, who was cool in high-school, but a failure now. 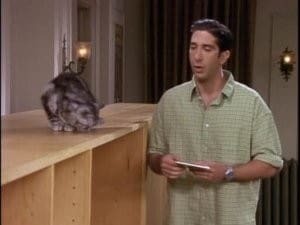 And when Joey and Chandler decide to sell the entertainment center, Joey takes stupidity to a new level.